How much are your customers willing to pay for what you sell? Getting the price right is notoriously difficult – especially online thanks to a plethora of price comparison sites. However, new research from Korea (where Internet usage is amongst the highest in the world) suggests that companies should not be too focused on offering low prices. The study shows that even people who are price-sensitive don’t usually buy the lowest priced item. In other words, people want value – rather than the lowest price for an item. 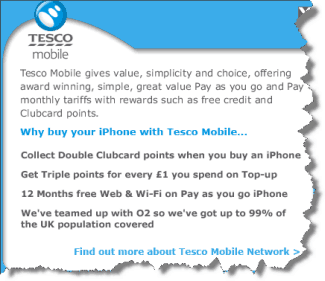 Interestingly, Tesco launched the iPhone this week at a seemingly low price of a mere £20 a month, compared with the competition from 02 and Orange at around £30 a month. But as analysis of the pricing structure shows, Tesco’s total offer is actually marginally more expensive than the iPhone from Orange. The headline figure from Tesco may well appeal to those price-sensitive individuals, but most people will be concerned with value. And if you check Tesco’s sales pitch it focuses on value, not really mentioning price at all. The iPhone has just been voted as the Gadget of the Decade by television’s The Gadget Show; not bad for a product that will set the average user back almost £1,000 at average contract prices. Yes, that’s right, a cool grand for a lump of metal and plastic that sits in your pocket and lets you phone people. It can do the same basic functions that a £10 phone can do with a fiver’s worth of top-up. So, why is it such a desirable product? It can’t be the price. Sure, the iPhone can do many more amazing and useful things than your average phone. Certainly, the iPhone looks good, feels good and is clearly an envy-inducing product. And, yes, the iPhone is more technically advanced than your average, basic Nokia. However, it is also much more pricey. What we get from the iPhone is value – not just lots of stuff, but lots of emotional value. It makes us feel good. And therein lies the “trick” with pricing. Even price-sensitive people want to feel good. So, what this new research confirms – as do examples like the iPhone – is the fact that businesses need not be swayed by the price comparison sites. Selling your product at the lowest price is not important (except for a small proportion of web users). What is important is ensuring you demonstrate real value to your customers. Your website visitors are sensitive to the prices you display – but only in the sense of how much those prices relate to the value your products and services provide. In other words, concentrate on showing the emotional value of what you offer and even price-sensitive purchasers will pay your higher prices.